So I promised you a special Christmas freebie and I've finally gotten around to pack it and upload it to Mediafire. I made it in colors that would match my December Daily album but so far I've forgotten all about it when making my layouts. Maybe this will serve as a reminder to myself as well. Actually there's usually a big difference between what I design and what I scrap with. Crazy I know. I signed up at PixelScrapper yesterday because I wanted to take part in their Blogtrain and they have a forum for designer challenges. 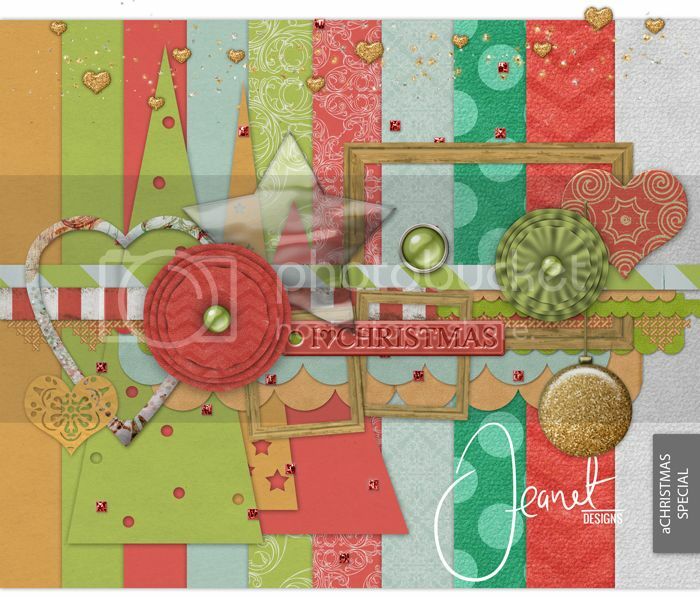 The latest challenge was to make a Holiday related kit with 10 backgrounds and 25 elements. The deadline was December 5 so at first I figured there's no way I'm going to get that done in time until I started counting what I had done for the already planned freebie. 10 backgrounds and 26 elements. So this will also be linked at Pixelscrapper. Anyway I'm going to keep it short today. We are supposed to be hit by a storm (called Bodil - who names these things anyway) later today so I've planned to spend the day on the couch with a book or movie and my dog to keep my feet warm - although knowing him it's more likely I'll be the one keeping him warm. He's spoiled rotten I tell you. Thanks so much Jeanet. I have loved your designs forever!!! This is one I have to download!!! Thank you for the wonderful Christmas kit.